One day he’s creating a playful, flowery typeface featured in the prestigious Mia, the next his sleek and modern font guides travelers across the MSP airport. He’s even hitting up sports, creating a font for the MLB. Whatever the project may be, Chank’s list of clients speaks for itself. As one of the rare font designers occupying the Minneapolis design scene, we’re excited to pick his one-of-a-kind brain at the upcoming Fresh Squeezed brunch. If you haven’t been fortunate enough to meet this character, join us June 24 at Ginger Hop. Conversation starts at 11am. Chank was educated at Macalester College in St. Paul, Minnesota. 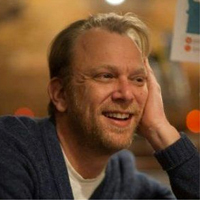 He began designing typefaces when he was Creative Director for the alternative music magazine CAKE. During this time, he road-tripped back and forth across the country visiting designers at various record companies and earning himself the nickname “The Traveling Font Salesman.” His fonts appeared on a number of album covers. Chank established his type foundry, Chank Fonts, in 1996, which he now operates from his home office in Minneapolis, Minnesota. He creates everything from custom fonts for corporations and ready-to-buy fonts for professional designers to the occasional free font for the masses. His fonts are seen everywhere, instantly setting the intended tone for packaging, advertising, video games, publications, you name it. It may only be 26 letters (well, uppercase and lowercase, plus a fistful of symbols) but what they say is more than what they spell. View his work here. 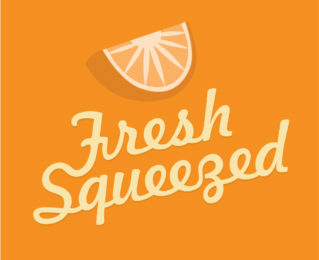 Fresh Squeezed aims to facilitate an empowering community for emerging designers through a series of monthly brunch discussions. Over coffee, eggs, and perhaps a bloody mary, AIGA Minnesota members have the opportunity to build their network, ask those burning career questions, and get real insights from fellow designers and industry leaders. Each month, a spotlight speaker will lead the discussion on a topic related to career development, perfect portfolios, innovations in the industry, and more. This is where we explore the essential topics that you were never taught in school, or have been dying to ask since you broke into design.